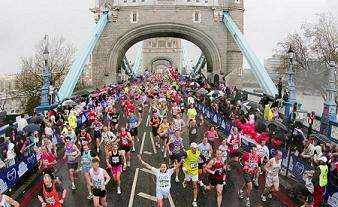 I love the London Marathon – have you ever been? It’s an amazing day. London is transformed into a hub of positive energy. Everyone is willing the 39,000 runners round the course, its like a big emotionally charged street party, and everyone is invited. There are some sights to behold too; People who shouldn’t ever be running anywhere are pounding the streets, held together with sticky plasters, knee and ankle supports. There are some ingenious and ridiculous costumes, rhinos, pirates, supermen, emus, people linked together in hand-crafted canoes or as 5 person caterpillars (?! ), my personal favourite was a really really tall giraffe cobbled together from toilet rolls and sellotape. For me, The London Marathon proves that if we have belief and passion coupled with determination and a focus, we can achieve incredible things. Many people take part in London Marathon and leave determined to achieve other goals, many spectators feel humbled by what they have experienced, and leave with a new vigour to fulfil their personal challenges. When did you last feel like that? When did you last feel inspired to achieve something great? Just imagine, if we could all hold onto that inspirational London Marathon feeling every day how much more could we achieve? This entry was posted in fundraising, Inspiration, Uncategorized and tagged charity, costume, emotional, energy, fancy dress, Inspiration, London marathon, making a difference, passion, running, stories. Bookmark the permalink.